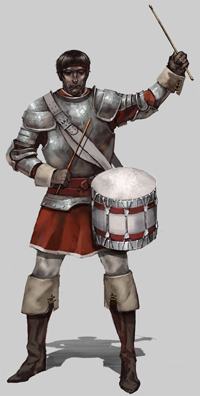 The Drummer increases your army’s morale. Each Drummer adds 0.5% to the Leadership skill. The bonus is added at the begging of each round, depending on the amount of Drummers that survived the previous one. If at the beginning of round 1 you have 10 Drummers that are alive, they will give you a bonus of 10 * 0.5 = 5% on the Leadership skill.If in this round of battle 4 of them perish, in the next round you will get only a 3% bonus form them, because 6 * 0.5 = 3%. Apart from giving a bonus, the Drummers also increase the maximum bonus that can be acquired, over the limit presented by the skills. The limit becomes 40% and it can be achieved either by a combination of bonus from Skill and units or by units only. If you have the Leadership skill developed to Advanced this brings you 20% to Leadership. If you also have at least 40 Drummers that are alive, they will give you an additional 20%. This way the skill bonus reaches the maximum of 40%. Another option might be that you don't want to spend skill points on the Leadership skill. In that case you can achieve the maximum with units only. For this purpose you need at least 80 living Drummers to reach the limit of 40% (80 * 0.5 = 40%). Characteristics: Accessible only to the Britons. This unit receives bonuses from the skills Defender and Warrior.